In the age of smartphones, we have more photos of our family than ever before. But are they being used to their full potential? Are you fed up with just having them on your phone or computer? Do you wish you could put them all proudly on the wall, but just not sure how or where? Creating your own wall display can seem like a daunting task, but we promise it's a lot easier than you think! Here are our five steps to successfully create the perfect display. These different size images should give you an idea of how big a print you need. 1. Carefully choose the image size. Where you choose to display them will affect what size of image you need. On this wall , a 10" x 8" would look pretty lost, a group of three 20" x 16" frames might be a better choice. If you're struggling to imagine it, cut some pieces of paper in the above dimensions, tape them on the wall and stand back. Try a few different combinations to find your favourite. A Quad wall art gallery from one of our relaxed, bluebell family photography sessions. Want to make a real statement? Consider grouping images together. Combining a selection of your favourite images means you don't have to make that difficult decision to pick just one! Don't be afraid to mix landscape and portrait images. They can work in harmony, like this quad wall art gallery. In this multi print frame, the black and white image is in the middle allowing the colours to balance beautifully on each side. Images taken on one of our relaxed, family photography sessions. If you are using several images, it is essential that you match and balance the colours. So long as the images compliment each other, a mix of black and white and colour images can also look stunning. The framed prints in this wall gallery are naturally suited to each other because they are a similar colour. 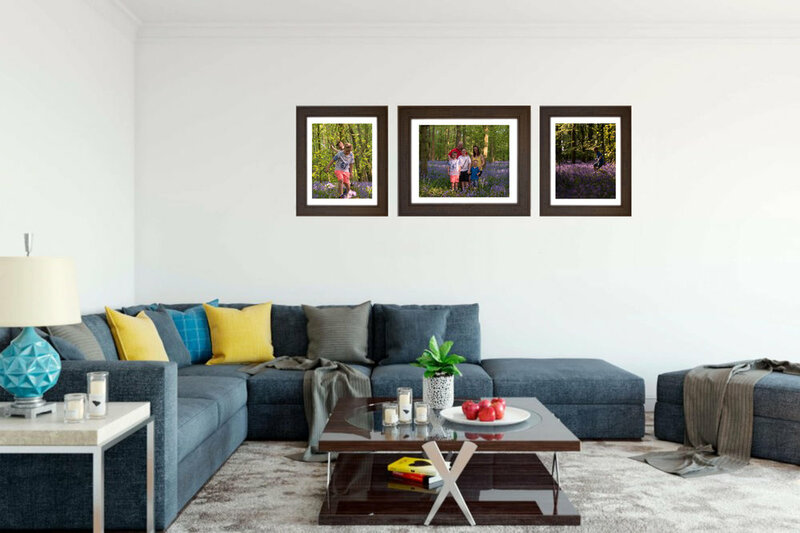 They were taken on one of our relaxed, family photography sessions so the images can be paired up nicely in a Duo wall gallery. For example, images taken in different seasons or lighting conditions don't match well. The images in this gallery were taken in the same season and so work really well together. If you're not too sure whether your colours match, get 5" x 7" prints and arrange them next to each other or view them side-by-side on your computer screen. Plan it out. Make paper templates of all the frames, line them up on the floor and then put them on the wall. Like what you see? Great! If not, play around with it. Move things around until it looks stunning. Put the central image up first. Use this as the anchor image and arrange the rest around it. Struggling to make it work? 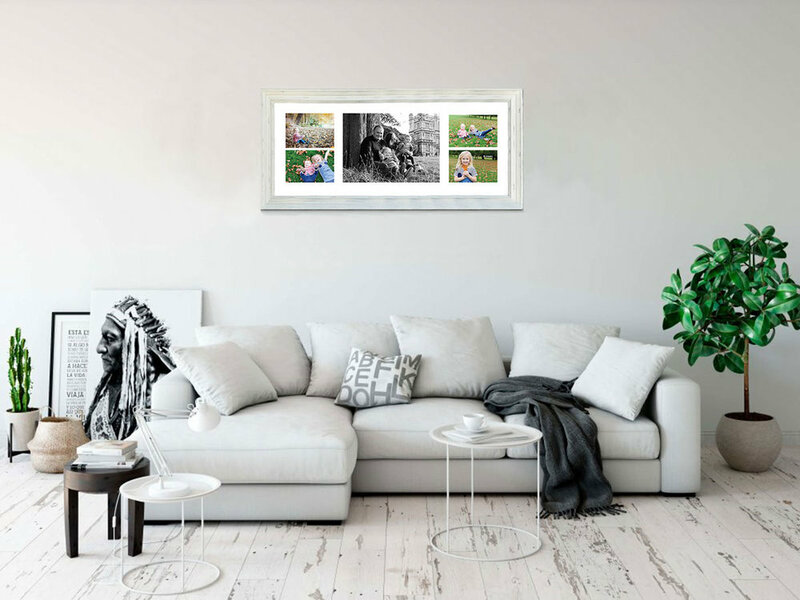 When we do a family photography session, we use software shows you what your images will look like in frames on your walls, so you can tell if it's too big or small and if the frame suits your walls. 5. Ensure the subjects are facing towards the centre. The subjects (i.e. your family members) in the images on the outside need to looking towards the centre. This brings the whole gallery together, draws the eye in and from there you will naturally look across to the end images. Hopefully, these 5 simple tips will help you to plan your very own wall display. If you have any questions, or need any advice don't hesitate to contact us. P.s Click here to find out more about our relaxed, family photography sessions, including a wall art design and planning session to create your very own wall gallery. We’ve got bluebell season on the way too!